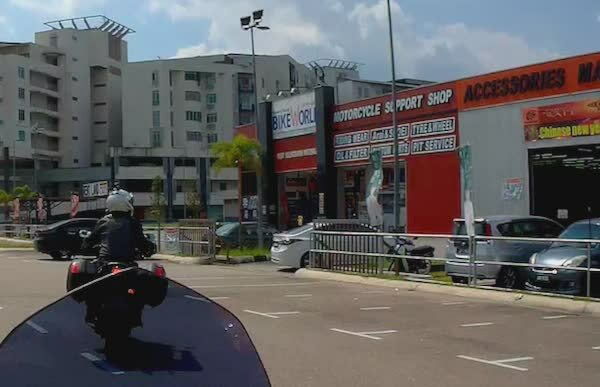 Yet another sgBikerBoy Sunday Morning Ride! 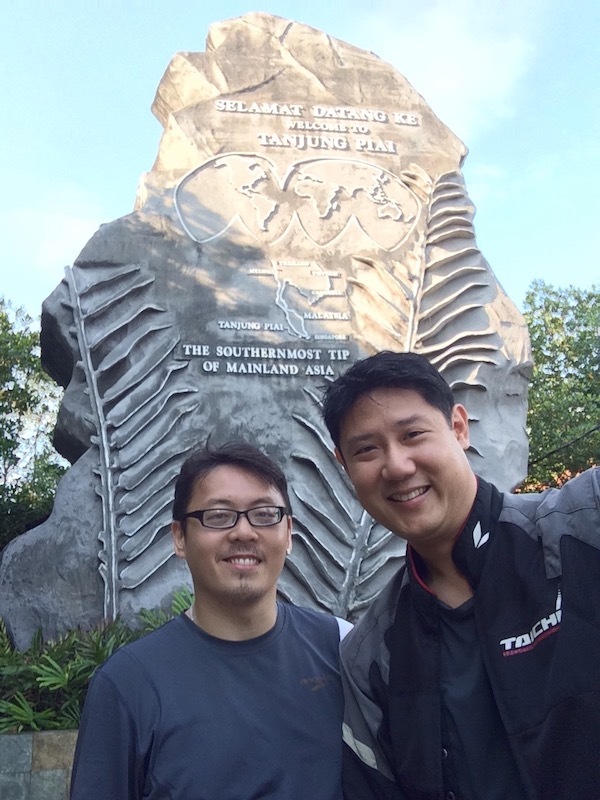 Running out of ideas for nearby places to ride to, we decided to head to Tanjung Piai again. Anyway, it’s been almost a year since I last rode there. But for my riding buddy, Siu Hon, this was a first experience for him. Anyway, like they say, it’s not about the destination, but it’s all about the ride. So, my 200cc Pulsar and Siu Hon’s recently acquired 600cc Yamaha XJ6 Diversion met at B-Point, Johor Bahru. We settled for a quick breakfast before setting off. In the previous ride there, I used Waze to guide me. 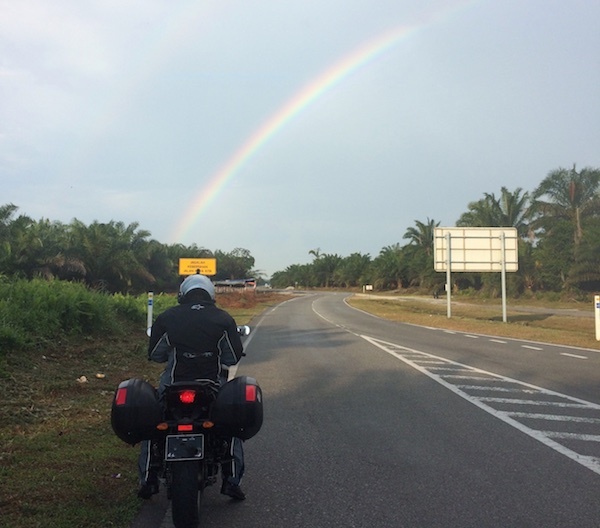 Waze seem to suggest a more conservative route – sticking to the main roads, heading to Pontian before turning south towards Kukup and Tg Piai. For this ride, we decided to use Google Maps instead. Google Maps seem to suggest a shorter (faster?) route that will take us through some really minor roads. Hey! We’re on motorcycles! After all, what can be more fun than taking the small roads right? The Google Maps route to Tg Piai. And it was such an amazing decision! Google Maps took us through some really kampung*, really ulu* roads. In fact, if I recalled correctly, J110 was a bi-directional road that was really only wide enough for 1 large vehicle with no centre lane markings. This meant that if a vehicle approaches from the opposite direction, even small vehicles like our motorcycles will have to swerve aside to pass one another. Really fun roads! Unfortunately, I’ve forgotten to switch on my camera and missed recording this road. Then, just as we were having fun, it started to rain. Then it began to POUR! Oh bummer! Quite quickly, we pulled to the roadside and took shelter under a tree as we don our rain suits. And almost as if the heavens just wanted to watch us do the rain suit dance, the rain stopped quite quickly after we put on our waterproof wear. Oh well… Thankfully, the morning weather was sufficiently cool for us to keep the rain gear on and continued riding. This picture doesn’t do sufficient justice to the most amazing rainbow I’ve ever seen! And when the sun reappeared after the rain, I spotted the most amazing rainbow I’ve ever come across! Unlike most rainbows I’ve previously witnessed, this one wasn’t “faint”, but the colours were thick, rich, and strong. Siu Hon described it as very “gao” (as in like, kopi-o-gao). 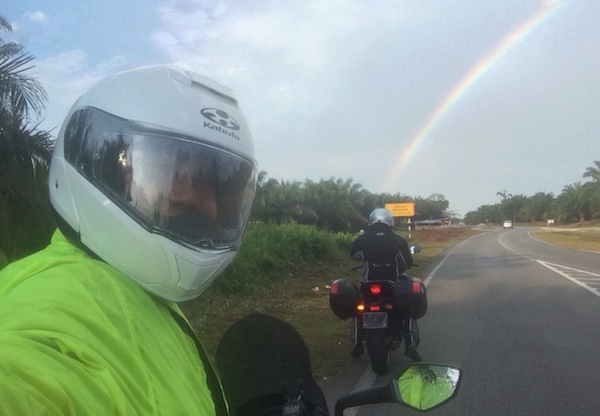 The Pulsar, the XJ6, and the very “gao” rainbow. Before long we reached Tanjung Piai – the (so-called) southern-most tip of Mainland Asia – a description I personally disagree. I think somewhere in the south of Singapore is more south than that! Well, you could argue that Singapore is separated by a body of water. 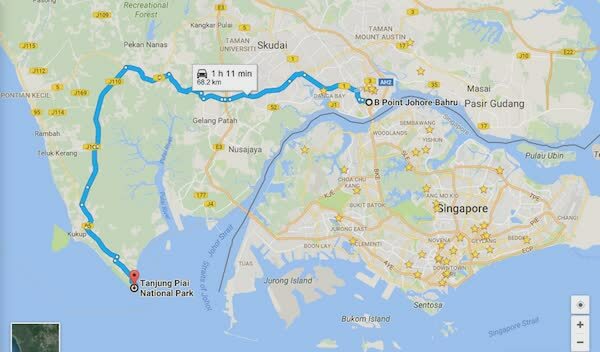 Then again, Singapore is also connected to Peninsular Malaysia via a causeway, not a bridge. The Tanjung Piai monument photo shot. Entrance fee to the park was RM5 for Malaysians, and RM20 for non-Malaysians. I really wouldn’t mind paying RM5 to explore the park inside. Perhaps even RM10. But at RM20, we both decided that it wasn’t worth the price, and just hung around outside and chatted. After a (somewhat long’ish) rest, we then headed to BikeWorld near Tebrau City. BikeWorld is a Japanese “Megastore” that sells motorcycle related stuff. It shares the same building with Autobacs and with very similar layout. I suspect the two stores are somewhat related. Siu Hon was looking for a tank bra for his XJ6, but unfortunately they didn’t carry it. And after some window shopping, we both headed to a nearby Shell station to feed our mechanical steeds before heading back to Singapore. It was yet another amazing Sunday morning ride! * “kumpung” means (typically small) village in Malay. * “ulu” means (rather) deserted. Quite honestly….nah. You can get most stuff in Singapore for about the same price.